This unit is from BEEM. Its coding and art were done by Voodoo, Baro_st, Tydeus, Dibs, and various others. 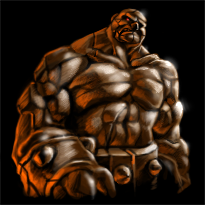 Golems are huge monsters completely made of hard hock, therefore they are immune to every type of poison. Able to live entire eras, these warriors are practically indestructible. Their only weak point is their weakness to arcane attacks due to the enchantment which gave them life from stones and which can be broken only from another spell. The Golems move rolling on the ground as enormous boulders thrown from a cliff. The incredible power of their fists, with the ability to perfectly camouflage themselves among the rocks, makes them one of the most feared warriors in the world. The bigger ones are able to be lethal simply with the shock wave induced from the impact of their fist on the ground. Last updated on Sat Apr 13 01:30:06 2019.